Once we hit October, our family eats a lot of Winter Squashes, also called “Hard-Shelled Squashes” because they are not soft and edible like a “Summer Squash”. 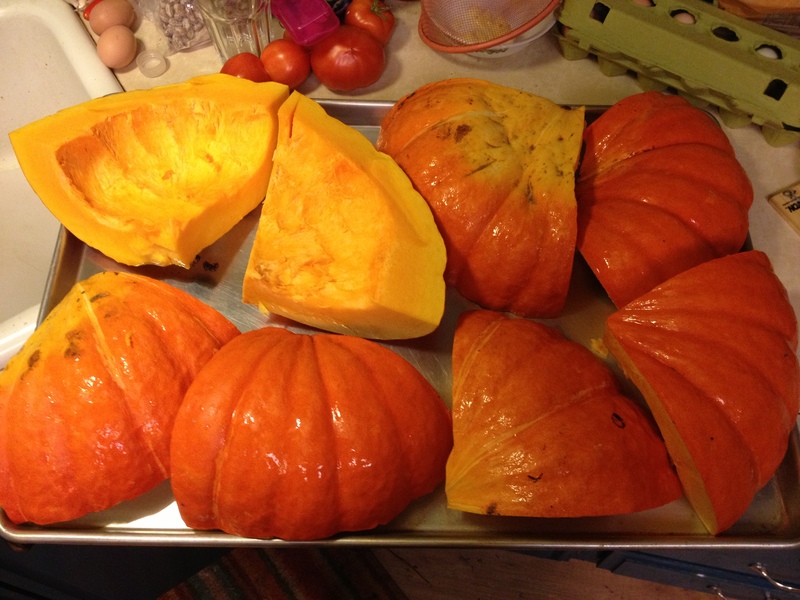 We eat squash at least once a week, and so I tend to cook a lot of it and freeze leftovers for pancakes, soup, squash purée, muffins, bread, etc. It’s useful stuff. 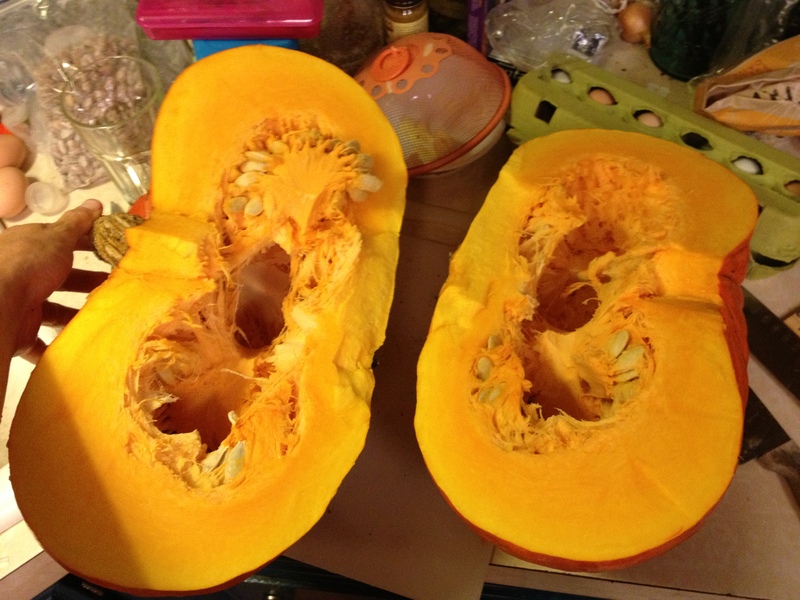 Because I do a lot of Squashin’, cutting open a squash is second nature to me. But I understand that squashes can be intimidating creatures. I put this little work-page together to demystify the butchering of these unwieldy beasts. First, get a cutting board and large, sharp knife ready. Take a moment and get familiar with your squash. I find it easiest if I cut the stem end of the squash off first, shown to the right of this photo. 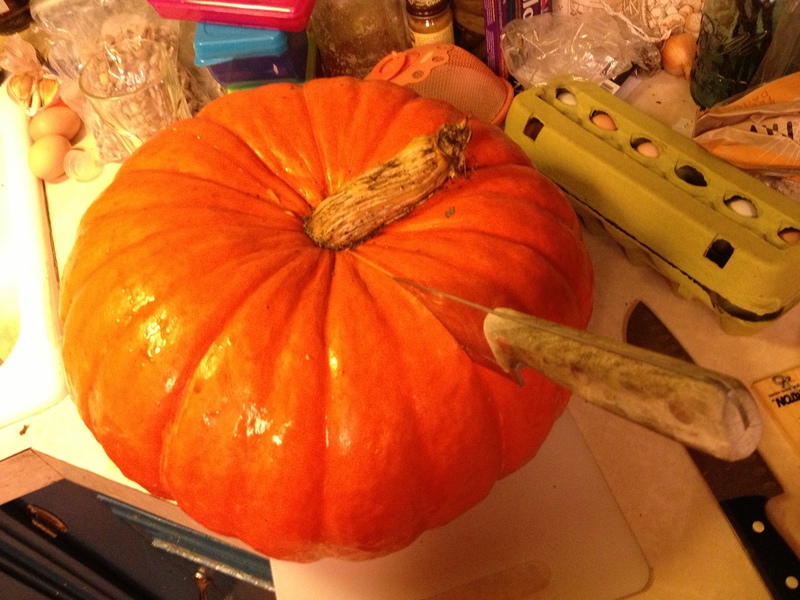 Then set the knife lengthwise on the squash to cut it in half. You want to brace your elbows into your body, keep your fingers out of the way, and push down. Sometimes it helps to rock the blade of the knife a bit. 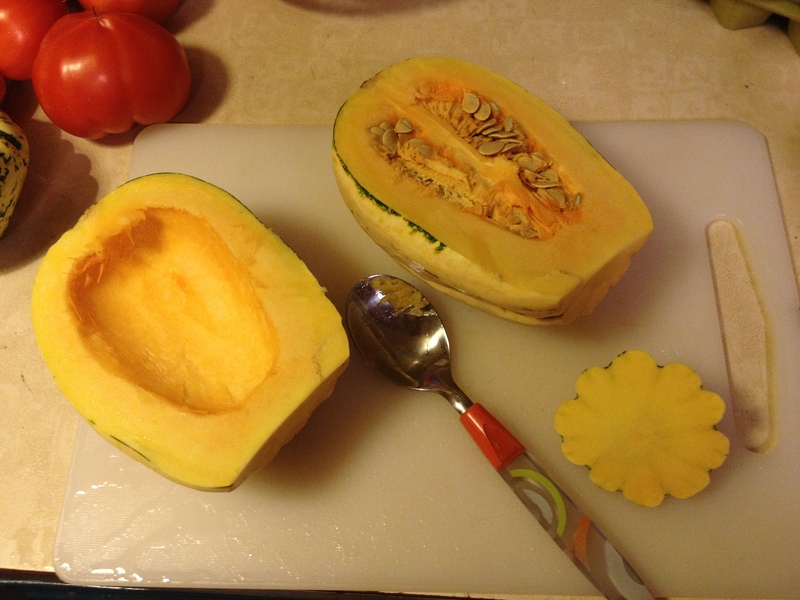 Then use a spoon to scoop out the seeds and entrails of the squash, so it looks like the half on the left. 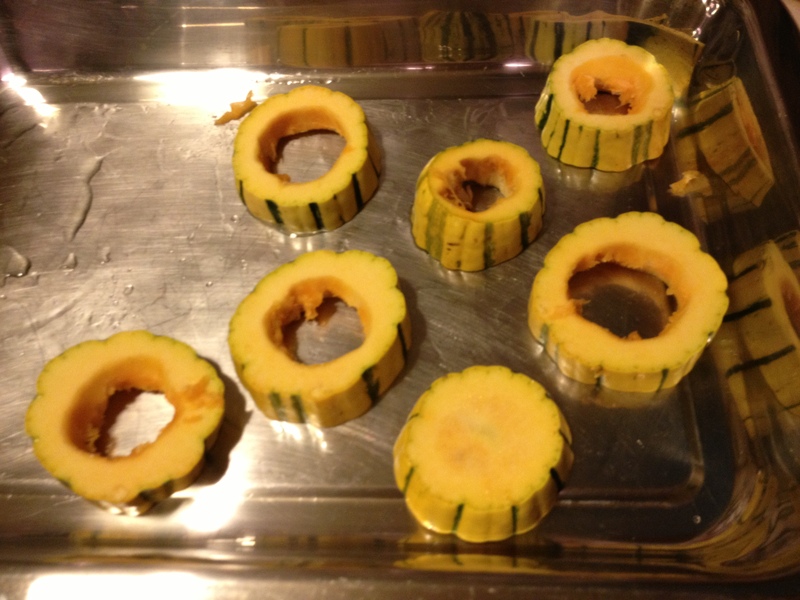 With the smaller squashes like “Sugarloaf”, “Delicata”, and “Acorn”, you can eat the skin, so I cut the squashes into rings and cut the entrails out with a paring knife. Brush the cut edges with a bit of olive oil to keep them from sticking, and put them on a baking sheet. They cook really fast this way. 350° for about 15-20 minutes. Poke them with a fork to see if they’re done. You can brush them with a bit of honey or molasses if you want, but it’s not necessary. Rub the cut edges and cavity with a bit of olive oil or butter to keep them moist and prevent sticking to the pan. Then turn them over and place them cut-side down on the baking sheet/pan. Bake at 350° for about 30 minutes. Poke them with a fork to see if they’re done. If the fork slides in easily they’re done. 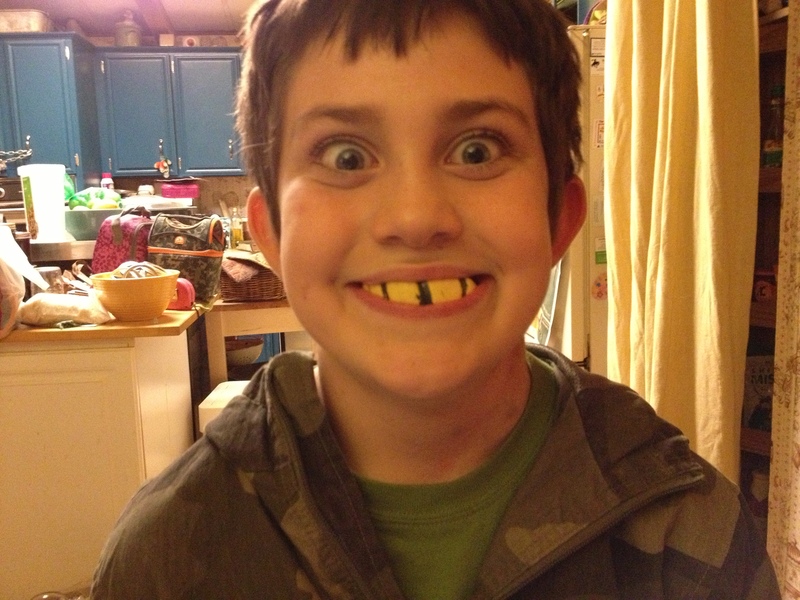 If you cut your squashes into rings and bake them, you can have cool teeth like these after you’re done eating. 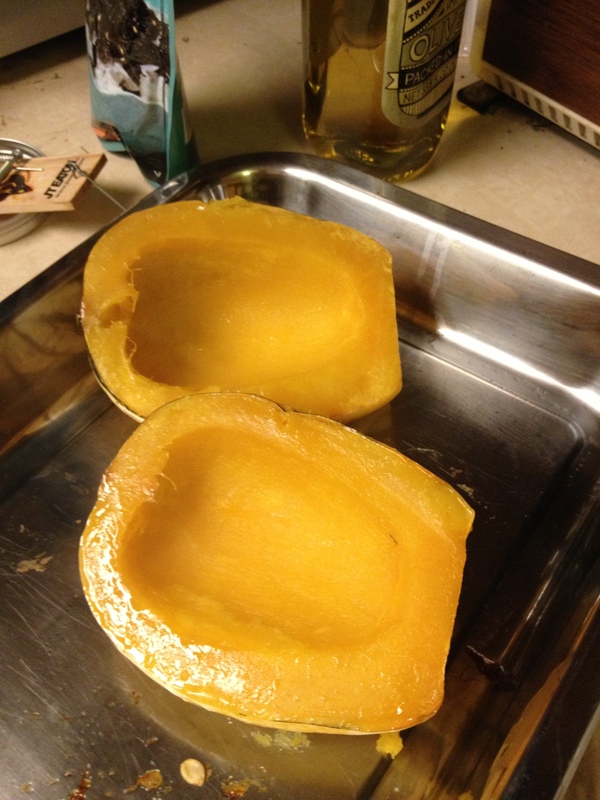 The bigger squashes, like pumpkins, Hubbard, Red Kuri—or my favorite, “Cinderella”—are best steamed or baked over a bit of water. You can also cook chunks in a Crock Pot. The one in this photo is about 20 pounds. I use the same knife and cutting board, but you need more elbow room. 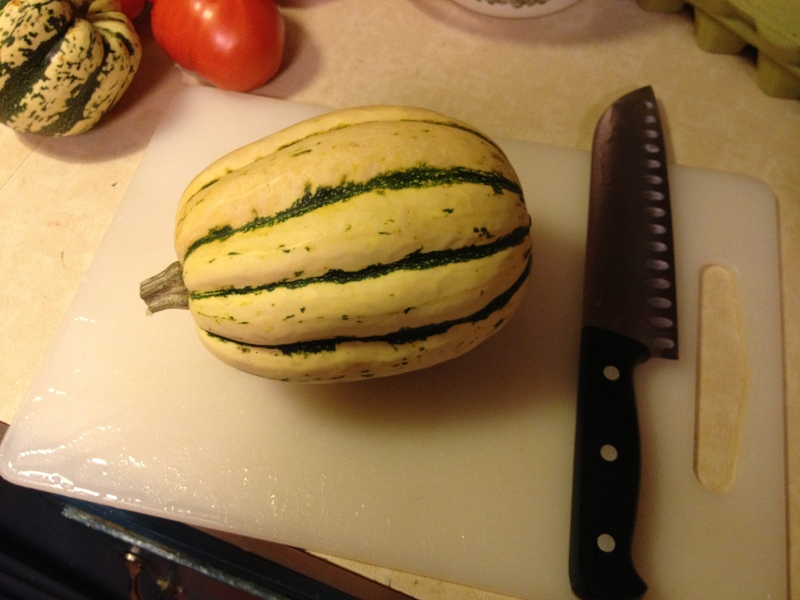 I start by cutting the squash in half, just to one side of the stem. You can see where the knife is inserted. It does take a bit of muscle to maneuver around the whole thing, but you can do it! Keep your elbows braced into your body so you don’t slip and cut yourself. See! I had to rotate the squash and knife a few times to get all the way around, but once you get started it’s not so bad. Take a whiff of that delicious, fruity, squashy smell. I LOVE it! You can cut the halves into as many pieces as you want. I just cut them into eighths usually. Scoop out the entrails from each piece with a spoon, so they’re clean like the two at the top left. Then place the chunks cut side down on the rimmed baking sheet. I have a giant oven, with giant baking sheets, which is handy, but you can use a regular-sized oven too. You can also layer them a bit. They can get cozy. Once they’re settled, pour water into the pan to a depth of just 1/8″ or so. You don’t need a lot, it’s just to keep them moist. 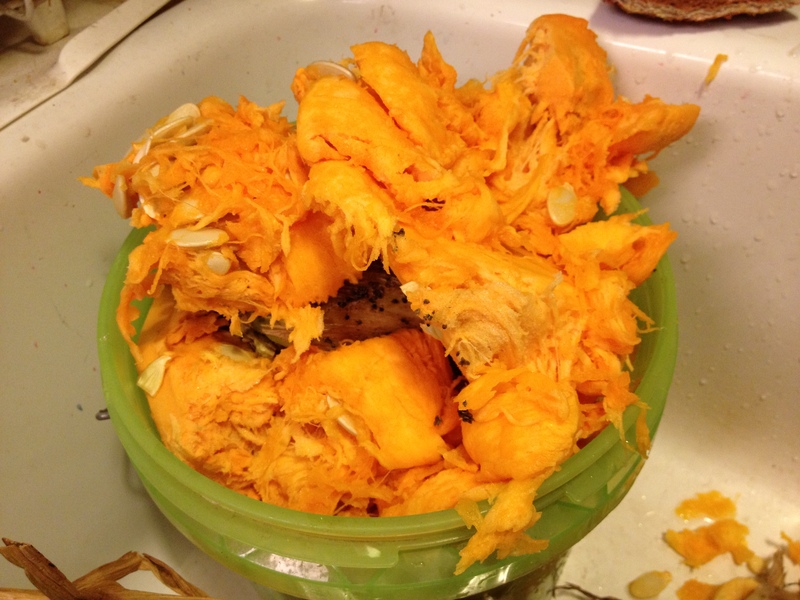 If you have chickens, or pigs, they love all the squash and pumpkin guts. 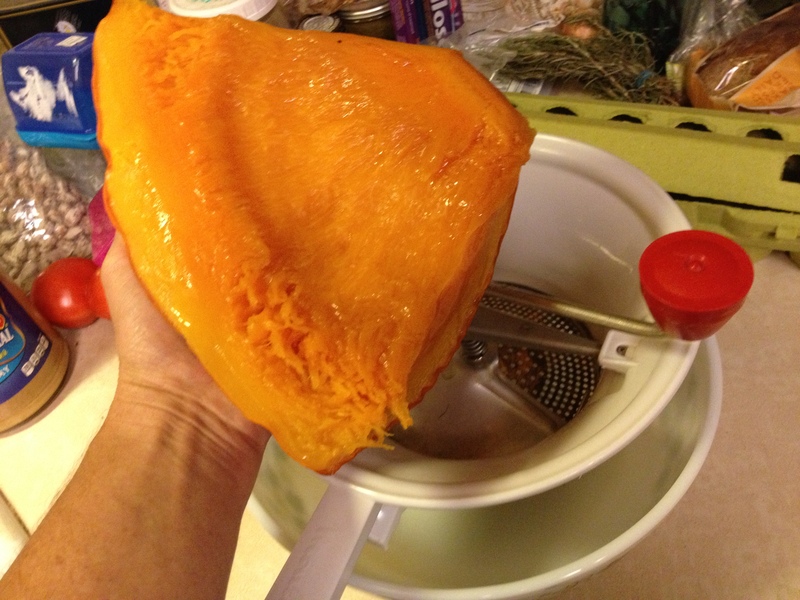 The seeds of small squashes and pie pumpkins can be cleaned and roasted, but the seeds of larger squashes have hulls and are not easy to eat. When you can poke a fork into the squash easily, they’re done. Take out the pan and let it cool enough to handle. You can see that the chunks have collapsed and wrinkled a bit, so you know they’re done. Don’t let them get too dry or you won’t be able to purée them as easily. 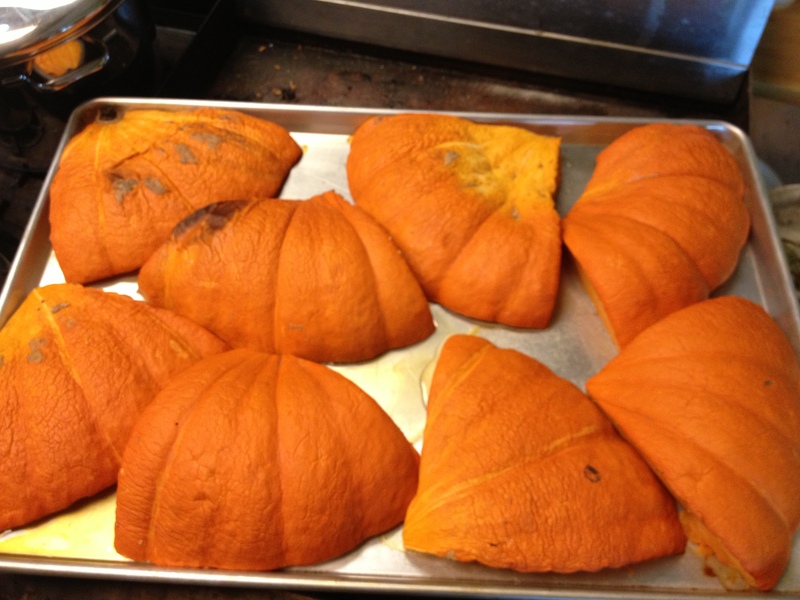 Take a whiff of roasty, delicious pumpkin. Mmmm! When they’re cool-ish, use a spoon or spatula and scoop the cooked flesh away from the skin. I like to use a Food Mill to purée because it leaves a little texture and removes strings and other inedible bits, and it’s people-powered. But you can use a food processor or blender as well. 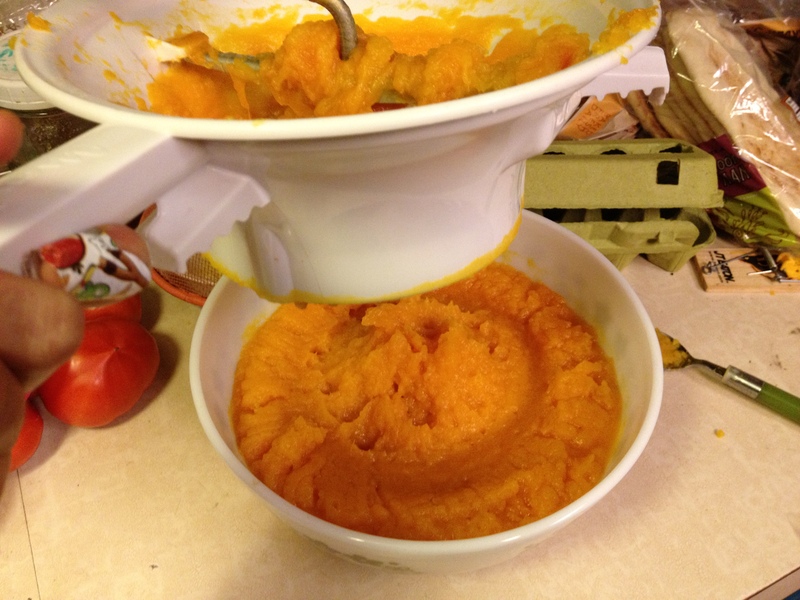 Here is the food mill in action. Creamy purée comes out the screen in the bottom and is ready to use. 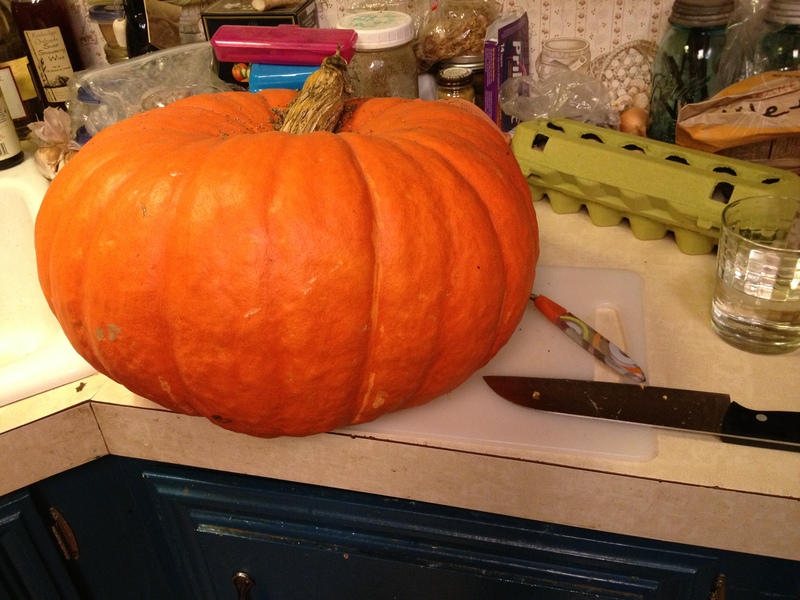 This 20-pound pumpkin yielded about 10 quarts of purée. I made a big batch of soup with 4 quarts (and froze half of the soup), and then froze the rest of the purée for later, in 2-quart packages. It’s handy for pies, custards (pie without crust), pancakes, muffins, or soup.